It all started with good intentions. Those New Year’s resolutions… that bulleted list you slaved over for a week to construct. So why haven’t you lost the weight yet? I thought you were going to cut out that toxic person? What in the world happened? Listen I’m all about a good list, I really am. I’m not bashing your goals. I think it’s great that we as people see the need to change. I think it’s great that we set goals for ourselves. My observation is this: We start our resolutions only to find ourselves one day behind. We think wow what happened? Instead of forgiving ourselves and continuing with our goals, we just abandon them. Too far gone right? I’ve already missed a month. I had cheese fries for lunch. I texted him back… said I wouldn’t, but I did. Maybe next year? This just happens to be a parallel to what I struggle with most as a Christian. I can’t forgive myself and it keeps me from the best relationship I have. I’m on fire one day and then something happens. I look back and think: When is the last time I prayed? Followed by thoughts of unworthiness and shame. God can forgive me, but I can’t forgive myself. It keeps me hung where I am. Repentance is not hard for me, forgiving myself is. In 2012 my “Joyful Repentance” article was published in the December issue of Christian Woman Magazine. It’s funny how I picked it up and read it, still needing to hear those exact things I had written a year ago. I’m interrupting this blog post to share a summarized version of this article with you. “Create in me a clean heart, oh God, and renew a right spirit within me. Cast me not away from Thy presence, oh Lord, and take not Thy Holy Spirit from me. Restore unto me the joy of Thy salvation, and renew a right spirit within me.” These words from Psalm 51:10-12 have been put to music and form the basis of a favorite hymn. Be open about your failures. As humans, we like to make excuses by trying to defend or justify our sins. Real repentance requires that we come to God with a raw openness. We should try taking David’s example. When David confessed his sins in Psalm 32, he opened and poured out his heart to God. It is true that real repentance will reveal our brokenness. God wants that from us, we often try to be all and to do all, but we should be able to say, “God, I need you!” We aren’t perfect; we need God’s help. He desires for us to come to Him and accept His love. Flee from the temptation. What good would it be to express our regrets to God without fleeing from the things that caused them in the first place? Letting sin linger in our lives will cause us to be unhappy. Only by recognizing the sin and turning away from it with God’s help can we truly find the joy we are seeking. Seek God’s transformation. Lewis F. Korns, said it simply: “Genuine repentance must bear the seal of a corrected life.” Matthew 3:8 teaches that we must produce fruit worthy of repentance. Real repentance is proved be the way we live. Just do it. Make it more about transformation than talk. When we realize the sin in our life, we should immediately look to correct it not just talk about the changes that our needed. God wants to see us change. Set necessary goals, and conquer them! Great joy can be found in accomplishing the goals you set for yourself. When you read Psalm 51:10-12 or sing those words, find joy in the forgiveness that is available to you, Find joy in knowing that God is not keeping score. When he forgives, He forgets. Then forgive yourself as well. Do not down yourself for past mistakes; rather, strive to do better. 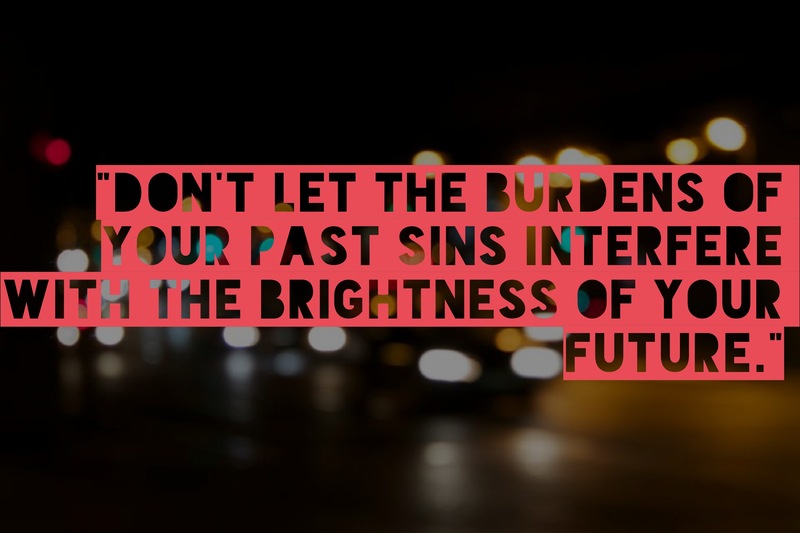 Don’t let the burden of your past sins interfere with the brightness of your future. Psalm 103:12 says, “As far as the east is from the west, so far has He removed our transgression from us.” So practice real repentance, and live every day with a clean slate! God is willing to help and forgive us as often as we need. But we must be willing to turn away from sin and seek Him! As you set your physical and spiritual resolutions this year I hope you stick with them. I hope that if you have any “2013 sins” haunting you that you take those to God. He will forgive you but do not, DO NOT forget to forgive yourself. Set ya some 2014 goals, stick with them… forget them and then remember them. Whether you forget to eat that salad or forget to talk to God. Realize it and fix it. Just please stop feeling so guilty. Darling, you can do it! If anyone can, it’s you. God didn’t give us Philippians 4:13 so that we could just paint it on walls and recite it before athletic games. He gave it to us to encourage us. You really can do all things through Christ who strengthens you. I hope you know that, I hope you believe it. This entry was posted in Uncategorized by katietaylor2013. Bookmark the permalink.